Last fall I wrote about the multi-use pathway that opened along a section of the Santa Fe Right-of-Way. Over the past few months I have used the path quite often, and am finding that it has slowly been discovered by other walkers and cyclists. Where this paved section ends at Delaware Street, path users must take the street for a few blocks to connect to the Ohlone Greenway along the BART tracks. Recently a fence in the connecting section of the trail was opened on a trial basis, so I decided to check it out. Actually, I had previously walked both of these undeveloped trails up to the fence on either side, so it was a nice feeling to not have to backtrack along my route this time! It was a very pleasant and quiet walk between houses and through the grassy field (which I imagine wouldn’t be so grassy if it was paved like the other section). After walking the Santa Fe section, I popped onto the Ohlone Greenway and walked north a bit through Berkeley to the Albany border. The trail continues through Albany, past the BART stations in El Cerrito to Richmond. There are several rail-trails and other multi-use trails in the Bay Area, most of which I have walked or cycled at some point. I am a big fan of trails like this that can be used for transportation and recreation, especially here in the population-dense Bay Area. The Ohlone Greenway is used quite a bit, but does not seem to be as wildly popular as some other trails I have visited. Some other trails can get so busy to the point of being unpleasant. If you have never been to a path like this, imagine a trail filled with lots of walkers, runners, cyclists, wheelchairs, strollers and baby joggers, people with headphones, people walking three or four abreast and talking, inline skaters, etc. — it gets to be pretty dangerous. This has not been my experience with the Ohlone Greenway; commute times and weekend afternoons are moderately busy on the trail, but it has never been over-run by people. Also, there are separate cycling and walking paths in most sections, and often an additional informal trail through dirt/grass on the side — in other words, plenty of space to avoid most collisions. So what makes certain trails more popular than others for recreation use? Part of this is probably the setting. The most popular multi-use trails I have visited are in some natural setting — either through parks or along the water (Bay, reservoir, etc.) — as opposed to an urban area. It is probably an appealing combination for many people to have a flat, paved path that is easy to navigate with a bike/wheelchair/stroller, and get to experience nature at the same time. Another factor may be how much a trail is separated from traffic. Some trails avoid street crossings in some way, such as by an overpass or underpass. 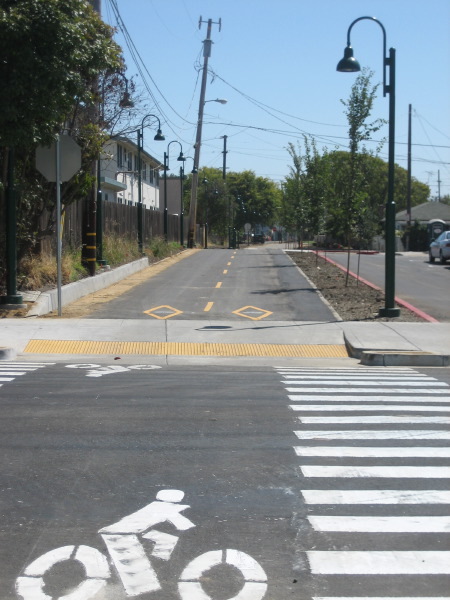 The Ohlone Greenway has many street crossings, some of which do not have traffic stop signs or lights. This isn’t too much of an issue for walking, but on a bike it can be a bit frustrating to have to stop so often, and dangerous in places. 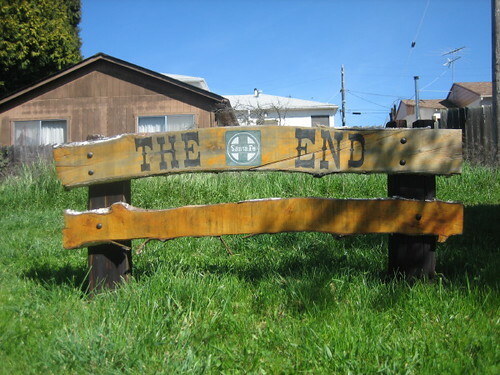 For fans of urban walks, though, the Greenway offers diverse sights, particularly in the Berkeley section: metal sculpture, murals, historical displays, exercise equipment, creeks, community gardens, benches, etc. Although I see plenty of people jogging along the Greenway, it is as much a place for strollers enjoying the sights along the way. This is not something you see much of on heavily used recreation trails. So the section of the Santa Fe Right-of-Way is open for a six-month trial period. Why a trial period? My walk in the daytime on the Santa Fe and Ohlone pathways was a pleasant one — spring flowers blooming, birds chirping, dogs being walked, cyclists on the way home from work or school — but this walk was during the day. Nighttime is a different story. While a few incidents of crime have occurred on multi-use paths in the Bay Area during daylight hours, the activity increases at night when it is dark and there are fewer people out and more secluded areas. There is also the concern that a fair amount of gang activity and drug dealing happens by bicycle, and creating an easy route between Richmond, El Cerrito, Albany, Berkeley, and Oakland opens up all of the cities to more crime. I am not an expert in city planning, but it does seem that one of the better solutions to minimizing this problem on the paths is to keep them well-lit. The section of the Santa Fe Right-of-Way that was completed last fall has many lights, and people on the trail are visible to passing cars and walkers. There is no dense shrubbery in this trail section, and there is an emergency call box at University Avenue. Some other trails are closed at night, but this isn’t very possible with the number of entrance points to the trails in Berkeley. If you want to check out the trial section of the Santa Fe Right-of-Way, you might want to start at University Ave. (just across the street from the Montessori school), walk the section that was paved last fall, cross Delaware St., and continue along the dirt pathway and through the now opened gate to connect with the Ohlone Greenway. The northeast boundary of Berkeley and of the area I am walking is Tilden Park. I originally thought that my walk of every street and pathway of Berkeley might include Tilden, but the park is actually located in unincorporated Contra Costa County. Although I like Tilden and its hiking trails, I am grateful that I do not need to walk the roads in the 2000-acre park, many of which are pretty hazardous for the pedestrian. Tilden offers hiking opportunities on a variety of levels — everything from a pleasant flat stroll to a strenuous trek up to Wildcat Peak or Vollmer Peak, plus a swimming lake, picnic areas, trails open to mountain bikes, steam trains, a botanic garden, a farm and environmental education center, and more. I have been pleased to learn from walking near the Tilden border that the park and its amenities are more accessible without a car than many other Bay Area hiking areas. For one, the 67 AC Transit bus runs every half hour or so from downtown Berkeley BART up through the park on weekends, and near the entrance on weekdays (line 65 also comes within a few blocks of the park). I also found that there a number of other ways to pop onto to trails in Tilden from the surrounding neighborhoods. This has been one of my favorite parts of walking near Tilden; to be strolling down the street and suddenly see a trail entrance. A few days ago I was reading an article in the Chronicle about the Berkeley State of the City address, one of the focuses of which was a vision for a more environmentally sustainable Berkeley. In the article, one Berkeley councilmember was quoted as saying that the environmental goals were “very optimistic”; “It’s going to be very hard to change people,” she said. “In my district alone, we’ve got to stop people driving up and down the hill four or five times a day.” This statement reminded me of the observation that I have found that the most unpleasant streets for walking are not just near the freeway entrances. Cedar, Hopkins, and Marin are particularly car-choked, especially on weekdays from about 2:30 on, as people pick up children from school, run errands, and come home from work. These streets seems to have a constant stream of traffic as the main thoroughfares from the Highway 80 and the flatland areas of Berkeley up into the almost entirely residential Berkeley hills. I am not the best person to come up with ideas for getting people to drive less and reducing the amount of traffic in the hills. My idea of what is doable in terms of walking is unreasonable for most people, and it is not my place to make judgments about how people use their time or the decisions they make about how they go about their lives. I have often thought that one area where traffic could be reduced is trips to parks and hiking areas. What if, for instance, shuttles (run on alternative fuel) ran every 15-20 minutes or so from transit hubs (such as BART or Caltrain stations) or downtown areas of Bay Area cities to the various city/county/regional/state parks? If you made it easy and pleasant, some people might be willing to leave the car at home rather than drive up winding roads and worry about finding a parking spot at the park. Realistically and logistically, this isn’t likely to happen anytime soon, so we have to make do with what is available. I hope eventually to research the best car-free ways to get to parks and recreation areas in the Bay Area, as it is often confusing to figure out and sometimes involves two or three different transit agencies. Tilden, luckily, is fairly straightforward and not too much of a hassle if you live in Berkeley or near BART. I also want to know what the shortest route on foot is from a the North Berkeley and downtown BART stations to Tilden. One of the nice things about Berkeley’s stairways is that a pleasant walk could be had up the various stairways from the flatlands to the park, avoiding some of the steep and winding streets. You may remember my post awhile ago about the playground construction at Cedar-Rose Park. A trip by there this weekend showed definite progress. It’s not done yet, and the turtle has not yet been re-installed, but the structure of the play equipment is there. Appearing closer to completion is the multi-use pathway along a portion of the Santa Fe right-of-way stretching from Delaware Street to University Avenue. The current section of the path that has been paved ends up at Berkeley Montessori School, which resides in what was one the Berkeley train depot for the Santa Fe Railroad. Much of the rest of the right-of-way, which used to be the route of the Atchison, Topeka, and Santa Fe Railway, is currently fenced off. Various proposals have been made for a continuous path along the right-of-way, from the Ohlone Greenway in the north through to Sacramento and Oregon streets in the south. All of this takes time and money, though. In the mean time, it will be interesting to observe this section of the trail, especially at the University end. Will students use the trail to walk or ride their bikes to school? Will traffic on University be affected by the crossing? (University is a thoroughfare to the freeway, and is regularly backed up with traffic to the site of this crossing.) After I had spent some time on the path with no one else in sight for some time and was walking back and pondering these questions, I was suddenly passed by a cyclist who seemed like he had used this route many times in the past even though it had just been built.